A perfect storm has been making its way through higher education (HE) in recent months. Excessive vice chancellor pay, an industrial dispute over the Universities Superannuation pension scheme (USS), an £800 million loss on the sale of the student loan book, questions about student value for money, and students having to go to food banks to be able to survive while at university. But is this a moral panic? Yes, of course. But that doesn’t mean there isn’t a genuine problem. The Tories rushed the 2017 Higher Education and Research Bill through Parliament – the crowning jewel of seven years of market reform – just before a snap election that turned out to be a spectacular fail. Now the Tories are weak and are facing opposition on a variety of issues, not just from within Parliament (especially from a Corbyn-led Labour Party on the up and up) but also from the media – on both sides of the political spectrum. The central problem that all of these painfully public crises point to is the failure of ‘marketisation’, which began in earnest seven years ago when David Cameron’s Coalition came into power: massive cuts to public funding of universities, the introduction of student fees and loans, and the entry of for-profit ‘alternative providers’. Has any of this actually improved higher education? No. Students are now leaving university with £50,000 of debt (HE Marketisation, 27 October 2017) and the prospect of employment on a zero-hours contract or no contract at all in the ‘gig economy’. Universities are still greedy for more income, leveraging decades – sometimes centuries – of history and reputation for risky bank loans in order to fund speculative fixed asset investments. So who is to blame? The vice chancellors? Not really (bear with me). Jo Johnson, current Minister of State for Universities, Science, Research and Innovation? Not entirely. David Willetts, the brains behind marketisation? To some extent. Andrew Adonis, trenchant critic of VC pay levels but at the same time partly responsible for introducing £3000 student fees under New Labour? Partly. But marketisation really began much earlier. Not surprisingly, it was a project initiated under Margaret Thatcher in the 1980s. Anecdotally, the idea for income-contingent loans – the current model in which students only pay their loans back once they hit an income threshold after graduation – was first floated by Sir Keith Joseph in 1985. It was rejected by Parliament at the time. This is an important point, because privatisation and marketisation – key philosophies of the neoliberal Conservativism that Thatcher helped create – have never been popular. Rather than try to push such extreme policies through Parliament, the Tories have historically always preferred what Andrew McGettigan calls “creeping reform”. Marketisation in HE began not with Keith Joseph’s income-contingent loan suggestion, but with the reforms to university governance first outlined in the Jarratt Report. Jarratt proposed that universities should be governed not by academic senates but by private sector-like boards – made up of ‘lay members’ that are actually mostly business leaders – and led by vice chancellors as chief executive officers (CEOs). These reforms were applied to so-called ‘modern’ universities – newly privatised polytechnics – as part of the 1992 Further and Higher Education Act. From this point on, vice chancellors started behaving like their private sector peers (with many coming from the private sector) and post-92 universities – which were now “higher education corporations” – began emulating profit-maximising businesses (despite still having charity status). In other words, Thatcher introduced the norms of ‘monopoly capitalism’ – top-down management, dysfunctional governance and growth through expansion and/or efficiency – into the higher education sector (HE Marketisation, 4 October 2017). At the same time, Thatcher drastically cut public funding for higher education while steadily expanding the student population. In a classic example of Tory neoliberalism, the ‘objective’ conditions for marketisation were created, which could be completed at a later stage. In 2010, market reform was accelerated under a Tory majority Coalition government. Public funding for universities was almost entirely cut, fees were increased to £9000, income contingent loans were introduced, and legislation was tweaked to make it easier for for-profit colleges and universities to enter the sector. What changed? Apart from the Tories returning to government, the Financial Crisis gave the Tories an opportunity to engage in counter-factual history. The ‘austerity’ narrative created enough confusion for them to finally push through marketisation of public services, arguing that the ‘bloated state’ under New Labour had overspent in the good times and now the public had to suffer the consequences in the bad times. But why has it taken seven years for opposition to appear? Not just in HE, but in society more generally? Simply put, it takes a while for it all to sink in and perhaps controversially, for effects to be directly felt by the middle class. The working class – immediately demonised as benefit scroungers and chavs – bore the brunt of the cuts, as did those with physical and mental health problems. Migrants were also picked on by the newly enfranchised nationalist factions of establishment parties. The so-called ‘precariat’ – which is really just the ‘reserve army of labour’ – also felt the effects straight away, and were among the first groups to begin fighting back. Many ‘millennials’ – particularly those who went who had gone to university before or during the Crisis – decided to carry on with their education, doing Masters and PhDs, to ride out the storm. But the storm didn’t pass, and this highly-educated, rightly indignant population was faced with a limited range of career options, including service sector jobs and unpaid internships in the creative industries. Some remained in the academy seeking refuge, accepting zero-hours contracts in the hope that one day their contribution – including hours of unpaid intellectual labour in the form of teaching preparation and research – would be recognised by their employers and they would receive something resembling tenure (which had also been abolished in the 1980s by Thatcher). Some ended up in the ‘gig economy’, causing trouble there. A massive growth in self-employment has hidden the impact of the Financial Crisis on employment, enabling the Tories to claim that unemployment in the UK is at its lowest for 42 number of years. However, the ethical bad taste that companies like Uber and Deliveroo leave in the mouths of consumers shows a growing awareness that such companies are exploiting the ‘in-work poverty’ that thousands face within austerity Britain, as people attempt to supplement their real-terms diminishing income. The reality of a stagnating economy under neoliberalism is finally beginning to bite the middle-income population – particularly public service workers – as wages refuse to rise with inflation. The Tories are mystified as to why this is happening. It’s ‘stagflation’ all over again. Of course, activists and trade unionists know very well what is causing this: the devastation of collective bargaining as result of 30 years of outsourcing (both in the public sector and in the global division of labour) and aggressive union-busting practices. Today’s students – a generation that has reached adulthood within austerity Britain – are also beginning to see that they are being conned. For large segments of students from working and lower-middle class backgrounds, their £50,000 debt will not get them any closer to being able to afford to get ‘on the property ladder’: the Thatcherite meritocratic dream. A serious debate is emerging around the ‘value for money’ of £9,250 a year degrees. The government has launched an inquiry into the current system of student finance. But a Tory government, which still believes in the neoliberal myth of marketisation, cannot come to the only conclusion that makes any sense: that education is nothing like a consumer product in the first place. The focus on VC pay is important, because it raises the issues outlined above. But activists and trade unionists need to keep the focus on governance. Governance – lack of transparency in not just renumeration committees, but also at board and council level – is the underlying problem behind VC pay, and also the terrain on which to fight to solve the problem (see my first Editorial: HE Marketisation 7 October 2017). At a practical level, governance problems come from homogeneity in the make up of such bodies. VCs as CEOs appoint lay members that already agree with the university-as-business model of HE, and in many cases are driving the reckless growth plans that we are seeing everywhere in the sector (see for example, Coventry University UCU’s pamphlet, ‘Growth is ok…but what about quality?‘). Boards are also over-represented – as is the upper layer of the corporate world – by middle-aged, white men. Principles of governance – for example the Higher Education Funding Council of England (Hefce) Memorandum of Assurance and Accountability, the Committee of University Chairs’ Code of Governance or the Nolan Principles – which universities are required to follow, but often don’t, are useful to pointing out the hypocrisy of governance under marketisation (see for example the University of Southampton UCU’s blog). Is the answer a Co-operative University? Yes and no. On their own in a sea of marketisation – which has ironically made the possibility of a Co-op Uni a reality – such alternatives have little chance of survival (HE Marketisation, 30 November 2017). Marketisation operates through technocratic interventionism – the Teaching, Research and now Knowledge Excellence Frameworks (TEF, REF and KEF) – creating ‘proxies’ for competition through elaborate ‘light-touch’ regulation (which is actually very heavy handed and statist in character) in the absence of real competition. Co-operative Universities would be subject to the same (what Justin Cruickshank calls) “neoliberal interventionism” as traditional universities, post-92 universities and for-profit colleges and universities. It is, in a very real sense, a ‘rigged’ market. Furthermore, while the government tries to invent more and more ingenious ways to create a market utopia, it actually just ends up emulating the real one: universities become huge multinational corporations with existing corporations like Pearson lurking in the shadows in anticipation of the first ‘failing’ universities coming up for sale. As with VC pay and governance, the rigged market will end with monopoly capitalism: market consolidation and stable prices, neither of which benefit the consumer or any of the ‘stakeholders’ who rely on such corporations for their livelihoods. I have argued elsewhere for the important – and very exciting – role that activists and trade unions can play in fighting this as yet incomplete and arguably failing project of marketisation. Trade unions in particular can occupy the democratic-institutional space vacated by increasingly autocratic managers in universities-as-business. They can also rebuild local democracy through broad-based campaigns within local communities that have the potential to transform universities as ‘anchor institutions’ into hubs for the creation of socially-useful knowledge (HE Marketisation, 26 November 2017). But whatever you do, don’t fall for the myth of the market. It’s all a massive con. Excessive vice-chancellor pay has been the subject of controversy in recent months, culminating in a scandal at the University of Bath regarding an alleged ‘cover-up’. Debates around executive pay represent just one of a growing number of issues concerning higher education (HE), all resulting from a farcical experiment in marketisation inflicted on the sector by successive Tory governments. Sky-high returns for executives, however, are the norm in monopoly capitalism. The protests from political figures such as Lord Adonis and Jo Johnson, who are now wading into the debate following the scandal at Bath, ring hollow seeing as they are at the same time advocates of marketisation – they are merely reaping what they have sown. In August, Dame Glynis Breakwell, vice chancellor at the University of Bath who was paid an eye-watering £451,000 last year, was accused of a ‘cover-up’ after a motion arguing for increased transparency on the university board’s renumeration committee was voted down. In a letter to the Higher Education Funding Council for England (Hefce), Joe Rayment, a Labour councillor and former Bath University employee, blew the whistle on what he described as “questionable” events that took place at the board meeting. Hefce has now confirmed it will investigate the allegations of governance failure at Bath, after Lord Adonis raised the issue at the House of Lords debate on the ‘Public Sector Pay Cap’ on 13 July. The scandal at Bath has drawn attention to what the University and College Union (UCU) argues is a systemic issue with transparency at the level of governance. According to University and College Union (UCU) figures vice chancellors earned on average £227,834 last year – an increase of 2% compared to the year before and 6.5 times the average pay of academic staff. Because of public attention on this issue, Jo Johnson, UK Government minster for universities and science, has called for executive pay restraint at a time when academic pay has fallen by 2.8% in real terms. He has also decreed that VCs earning over £150,000 a year will have to “justify” their salary or face a possible fine from the newly-created Office for Students (OfS). Excessive remuneration for university executives, however, is just a one of many embarrassments caused by market reforms pursued by successive Tory governments. Almost all universities opted to take up the government’s offer of raising tuition fees to £9000 in 2012 – a rational choice as almost all public funding had been cut the year before – seeing student debt soar to obscene levels. Students, who must now also take out a maintenance loan, graduated last year with an average debt of just over £50,000, according to the latest research by the Institute for Fiscal Studies. Total debt has jumped due to an increase in student loan interest rates – now at 6.1% – with students paying an average £5,800 before they have even finished their studies. Political backlash from students and parents has grown in relation to the ability of the government to change the terms and conditions of student loans, which can be applied retrospectively even after students have graduated. Student (and parent) debt has also soared because of greedy landlords cashing in on students new to cities, who need to find accommodation quickly. “The average student rent now amounts to 95% of the maintenance loan given by the government, leaving just 5% for food, books, travel and entertainment,” it adds. Many of these problems are caused by contradictions and compromises in policy resulting from what McGettigan calls “creeping reform”. As with the National Health Service (NHS), market reforms are hugely unpopular and have the potential to explode into embarrassing political backlashes. Rather than going through the slow and highly public process of passing primary legislation, successive Tory governments have tweaked existing policy through secondary legislation or ‘statutory instruments’. Such instruments “can be issued quietly over summer while parliamentary representatives are on holiday – they come into law if no objections are tabled”, McGettigan points out. Another way that the Tories have tried to convince people that “there is no alternative” to privatisation and marketisation is by the simultaneously expanding and deliberately underfunding public services. Marketisation in HE, like its equivalent in the NHS, can be traced back to Margaret Thatcher, who not only attempted to introduce income-contingent loans – but failed after the proposal was voted down by Tory backbenchers – but also oversaw swingeing cuts to universities in the 1970s. According to McGettigan, funding under Thatcher dropped from its highest point in the mid-1970s at £11,000 per student to £6000 in 1996, just before New Labour came into power and introduced tuition fees of £1,000. During the same period, participation of 18-year olds in HE jumped from 15% to just under 35%. It was at this time that Thatcher reformed university governance and created the vice chancellor as chief executive officer (CEO). In 1984 a committee was established by the Committee of Vice-Chancellors and Principals (CVCP) – a forerunner of Universities UK – with Sir Alex Jarratt as chair. Its self-stated objectives were to find out “whether management structures and systems are effective in ensuring that decisions are fully informed, that optimum value is obtained from the use of resources, that policy objectives are clear, and that accountabilities are clear and monitored”. Among other recommendations, the report suggested that vice chancellors should be seen more like chief executives, and that the power of academics represented by senates should be checked by lay councils, which should also look more like the boards of for-profit corporations. A few years later, polytechnics were granted university status and made independent from local government control – a move that seemed progressive at the time, but would have grave implications for the future as these new ‘post-92’ corporations turned themselves into the model business-emulating institutions of marketisation that we see today. Far from being a ‘market failure’, excessive executive pay – or what Rebecca Boden and colleagues call ‘managerial predation’ – is the norm in monopoly capitalism. In the private sector, debates concerning executive pay and ‘shareholder value’ rage periodically, as the competing interests within the capitalist system clash. Executive power in corporations would, in an ideal world, be kept in check by active and varied shareholders, represented on the company board. However, as Paul Baran and Paul Sweezy described as far back as the 1960s in their ground-breaking book Monopoly Capital, company boards are dominated by collective investors that own large proportions of shares, such as hedge funds. Executives, far from being a ‘technocratic elite’, are in most cases also owners of shares. “Most managers are themselves big owners of stock (in their own and other companies) and as such have the same interest in dividends as other big stockholders,” they explain. As opposed to small shareholders, large shareholders – which are themselves financial companies and therefore maintain stakes in companies for longer – are more interested in keeping the value of stocks stable and increasing their value through improving profitability. Executives, who draw most of their income from their pay and benefits package, as well as from bonuses and expenses, are also more interested in cost savings (relative to their remuneration, which is also a cost) than high pay-outs. In practice, dividend policies are a compromise between the combined interests of executives and large shareholders on the one hand, and small shareholders who if left unhappy for too long, will club together and start exerting pressure on company boards. But for the most part, small shareholder participation is discouraged through over-complex information and lack of attention, so ‘business as usual’ tends to mean ever-increasing executive pay as long as they continue to deliver cost efficiencies. Separation of ownership and control in monopoly capitalism in fact hides an alignment of interest at the top of the capitalist system. “The fact is that the managerial stratum is the most active and influential part of the propertied class,” Baran and Sweezy conclude. Vice chancellors as CEOs, therefore, are merely anticipating the market in higher education that has so far failed to materialise and behaving according to the norms of monopoly capitalism. Fortunately, for-profit universities have so far – at least in quantities that would seriously ‘disrupt’ the existing monopoly of elite and ex-public providers – not flooded the system. Just before the snap election, which saw Theresa May’s majority in parliament shrink by 13 seats, the Tories managed to rush through the Higher Education and Research Bill, which made into primary legislation some of the back-door tweaks weaselled in over the last few years, as well as the new Teaching Excellence Framework (TEF). But the main bit of policy that the Bill was intended for was the simplified and hastened entry of for-profit universities into the HE sector. Behind this policy stands Pearson, a huge trans-national corporation (TNC) with an annual turnover of about £5 billion, which has been lobbying the Government for years trying to get its hands on the accumulated value of state-supported HE. As Ursula Huws has argued, TNCs like Pearson are sitting on piles of unproductive capital, looking for new markets to turn this cash into growth and super-profit. The so-called Public Service Industry (PSI) is worth about £79 billion a year, she points out. Pearson want to use massive online courses to capture the value of pre-existing academic knowledge – which through funding requirements is now largely ‘open access’, i.e. free to use and monetise – within massive online courses that will be free to try out (as you don’t mind the advertising) but will require a payment for the qualification at the end. In anticipation of this future, existing universities – particularly post-92 higher education corporations – have been ‘unbundling’ themselves, rapidly expanding through the creation of for-profit ‘subsidiary’ colleges across the UK and abroad. New TNC-aping ‘group structures’ are used to slash costs by rationalising workforces into a shrinking ‘core’ of relatively expensive academics and researchers who bring in research funding and create materials that are then ‘delivered’ by an ever-expanding ‘periphery’ of teaching-only, inferior (i.e. cheaper) insecure contracts. One of the first ‘alternative providers’ was created by Coventry University – CU College (now CU Coventry), a ‘wholly-owned subsidiary’ offering ‘life-shaped learning’ at £6000 a year (£3000 cheaper than most courses). Coventry University uses these subsidiaries to turn a profit. Last year, CU Coventry reported a turnover of just under £15 million in 2016, ending with £3.8 million profit. This profit is then ‘gift aided’ to Coventry University, which then pays no tax on this income, as it is a charity. Such experiments in corporate governance, imported from the private sector but with added bonuses in a quasi-public system like HE, allow staff to be moved around the ‘group’ – in other words ‘outsourced’ – circumventing collective bargaining agreements and further slashing staff costs. John Latham, vice chancellor at Coventry University, has been rewarded for this exemplary corporate behaviour with a pay packet £331,314 last year (an 8.5% rise from the previous year), as well as various accolades for the university, including Queen’s Award for Enterprise in 2015. Coventry University UCU branch has been waging a high-profile campaign against the use of subsidiaries to drive down staff costs and undermine trade union agreements. It has managed to win union recognition for English pre-sessional teachers in one subsidiary, CU Services, and is currently campaigning for recognition in CU Coventry. You can read about the campaigns at Coventry in the UCU branch’s pamphlet ‘Growth is ok … but what about quality, reprinted in the last issue of Post-16 Educator (Issue 88, July to September 2017). The campaign at Coventry was partly inspired by pathbreaking work at other branches, such as University of Central Lancashire (UCLan) UCU, which fought a long and eventually victorious battle against management, who were engaging the University in dodgy foreign investments in politically unstable countries. Bath University UCU branch, in partnership with the Student’s Union there, played a key part in exposing the scandal at the University of Bath. Collective action through trade unions remains crucial. 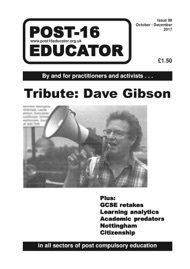 As I have argued elsewhere in Post-16 Educator (‘Still a new trade unionism in the making?’, Issue 86, January to March 2017), governance should be high on the agenda for academic trade unions, both locally and nationally, and governance-based campaigns often allow massive levels of public support and outrage to be leveraged for institutional reform. The problem of separation of control and ownership – although shown above to be something of a myth – is exacerbated in universities as it is not clear who in fact ‘owns’ the institution. Many of the conflicts of interest play out between on the one hand, the executive and the corporate-based ‘lay members’ of the board of governors, and on the other, staff – represented most effectively by trade unions – and community groups. Neither of the latter are considered ‘stakeholders’ in governance guidelines. Student interests can be mobilised in some cases, the University of Bath being an example as well as the student boycott of the National Student Survey at universities, but arguments that use the ‘student as consumer’ as their basis only serve to justify the status quo. Boden and colleagues have suggested the idea of a ‘trust university’ – modelled on the John Lewis Group where employees have a small stake in the company and the company assets are held in an irrevocable trust – as a possible goal for governance reform. Co-operative universities also provide an attractive model for academics looking to democratise existing institutions, with Mondragon University in Spain and the Lincoln Social Science Centre in the UK providing real examples. Paradoxically, however, such models are made viable through market reforms, as one kind of ‘alternative provider’ among others, including for-profits, all fighting for survival in the ‘zero sum game’ of marketisation.